Targeting is an invaluable tool to prevent a horse from spooking at objects. The concept is simple: when cued, the horse touches an object and then gets a click and food reward or just a food reward. My little black horse was very fearful of all objects: umbrellas, bikes, plastic shaking in the wind and now he eagerly seeks out objects to touch on the trail. It makes scary horse-eating objects become the focus of a game. When the horse becomes generally less startled, then he enters a more playful “seeking” frame of mind and generally takes a lot more stimuli to become spooky. 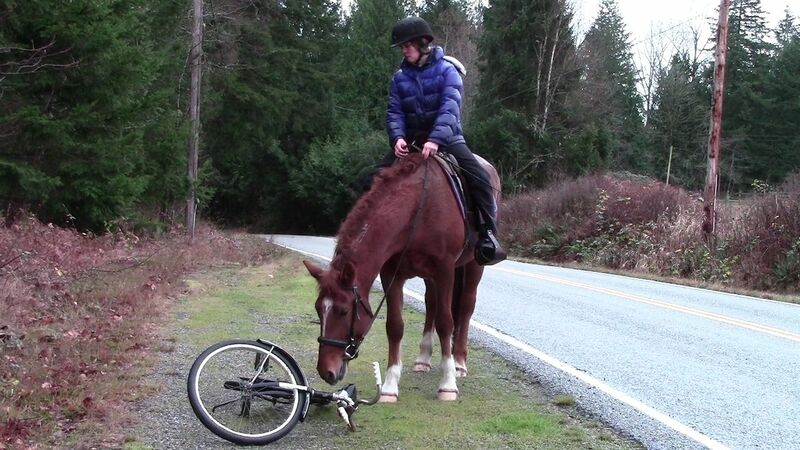 This idea that animals cannot simultaneously experience fear and be in a seeking mindset is central to Temple Grandin‘s book, “Animals Make us Human,” and it makes training a horse using positive techniques truly transformative.